GRAND RAPIDS, MI-Grand Rapids' ballpark was in need of a sound system upgrade. 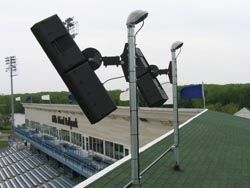 Not only was it necessary to improve the performance of the audio system, but the stadium was remodeled and the existing speaker locations would no longer work. The system needed to fit within the ballpark's budget and be simple to operate, while providing excellent voice and music reproduction and clarity. Additionally, the concourse speaker coverage was poor and needed drastic improvements. At Grand Rapids' ballpark, a structural engineer was contracted to ensure the integrity of the poles could handle wind load and the speaker weight of the Elctro-Voice SX600s. For Tom Billen, president of the Grand Rapids communications contractor ASCOM, the biggest challenge of the project was not this list of improvements, but trying to find the best location for the speakers. "EASE was used to model the stadium and a considerable amount of time was spent researching the optimal location," Billen said. Every possible location was considered and evaluated for overall performance and price. The largest portion of the building remodel was the addition of outdoor balconies for the private suites. The existing speakers were positioned just above these balconies. "The speaker positions cause the new balconies to block sound to the bleachers and created the potential for ear bleeding of those on the balconies," said Billen. The locations were quickly abandoned, and the light poles were utilized instead, due to the fact that they wer optimal for price, performance, and aesthetic value. Finding the original specification for the light poles proved to be quite a challenge. The company that manufactured the poles had been sold to another company. The fact that the light poles could handle the speaker weight and wind load had to be verified before the installation could proceed. Eventually, a structural engineer was contracted to gather the proper information to guarantee the integrity of the poles. ASCOM installed the poles for the central home plate speakers, but the location of the speakers proved to be impossible to access with a lift. Sitting nearly 125 feet from the nearest flat surface, scaffolding had to be erected to install the center speakers. A BSS BLU-16 processor was used for the system. Because the system is distributed, it was essential to provide separate delay channels to all main speakers to provide the proper alignment, minimize speaker interference and frequency cancellation. The concourse speakers also needed multiple delays and equalization. Electro-Voice SX600 speakers were selected because of performance, price, and ease of installation. The SX600 was specifically designed for outdoor venues, and its shape and mounting system make it ideal for use on lamp poles. 22 EV EVID4.2 surface mount speakers were installed to cover the concourse and under the balcony suites. The existing Crown amplifiers were reused to power the EVID4.2s. EV CPS2.8 amplifiers were chosen to drive the new speakers because of their performance and price point, and a Yamaha MG16/fx mixer provides the mix to the system. "It was great watching the excitement in the customer and the fans in the stadium when the system was used for the first game," recalled Billen. "The Whitecaps Baseball staff puts together a great, entertaining, family oriented show. They find creative ways to enhance the game, and the sound system really helps that cause."